Here is my version of the little fried egg. I didn’t have black eyes, so I used embroidery thread instead. Ha ha! 🙂 that’s the most adorable egg I have ever seen!! Great job! So cute! Does he need a bacon friend? I don’t eat bacon, but he can sure use a bacon friend. I am thinking of doing the teacup next to go with him. adorable!! toast would be cute too! 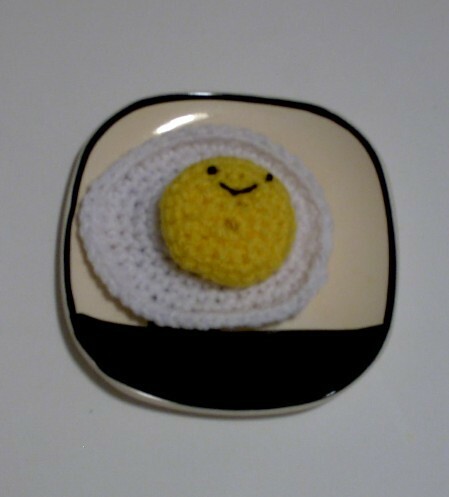 I have so many food patterns I will probably need the winter to get all them made.Your egg looks cute.